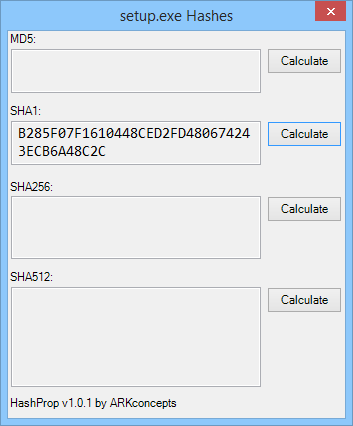 In essence, this replaces the various (unpleasant) solutions out there for calculating MD5, SHA-1, SHA-256, and SHA-512 for files in Windows. No more hunting for md5sum compiled for Windows. The source code is on GitHub, under the ISC License. You can download the precompiled installer to use HashProp right now. It works with both 32-bit and 64-bit versions of Windows. 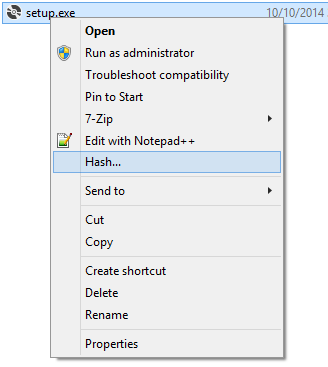 The initial version of HashProp added a new property page to the File Properties dialog, but it was discovered that the code for that isn't functioning correctly on all platforms, so the change to the context menu option was made.